WebHotelier offers a powerful tool called Rate Shopping, totally built into WebHotelier, which allows you to check parity rate and keep an eye on your competitors in a few clicks! Rate Shopping features a Parity Checker, which compares your official site's rates to the OTA's rates (Expedia, Booking.com, etc.) and it gives you the possibility to apply advanced filters such as length of stay, number of guests, etc. 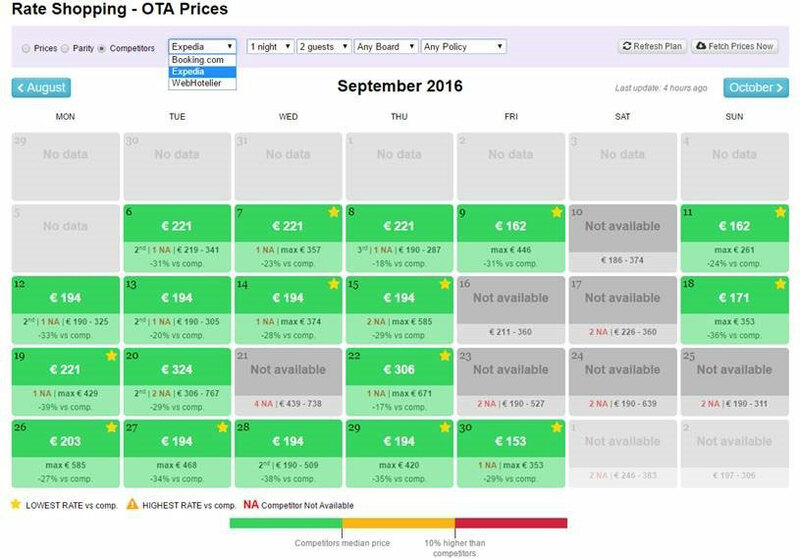 The slick and modern looking layout enables you to immediately identify disparities, which are highlighted in red in the rate calendar, where you can also see a breakdown of all the rates available on WebHotelier and the OTAs, just by mouse hovering over a date. Managing rate disparities has never been so easy! 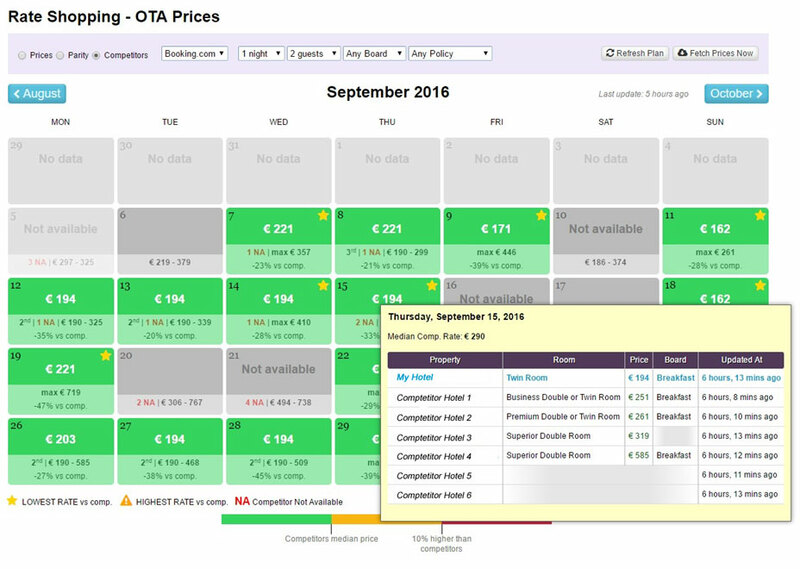 Rate shopper also features offers the Competitor Analysis Tool, which allows you to monitor the rates of competitor hotels on Expedia, Booking and other OTAs. 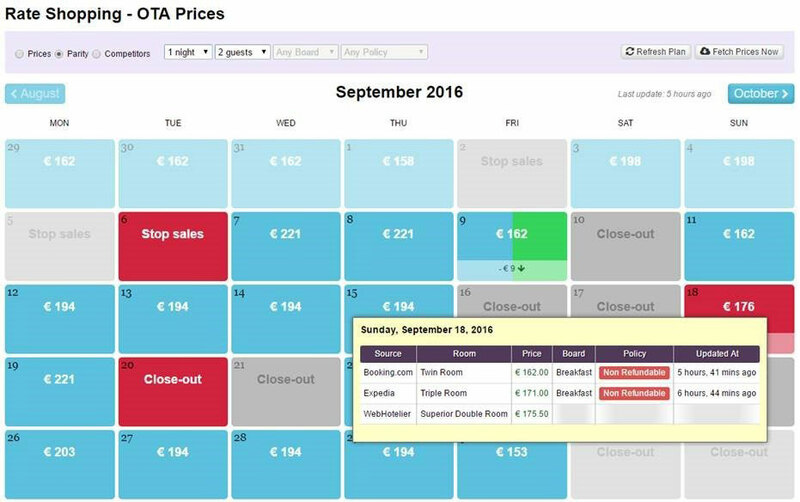 Pick your competitors and WebHotelier will show their rates for you! The user-friendly drop-down menu enables you to filter your search by channel (OTA), rate plan, cancellation policy, number of guests and number of nights. Just mouse hover over a date to immediately compare your rate to your competitor's! What are you waiting for? Activate it now to always be one step ahead of your competition!